Get started instantly! Everything runs from your web browser, with nothing to install. Easy to use. Animated coaches are available to guide every step. Customizable curriculum. 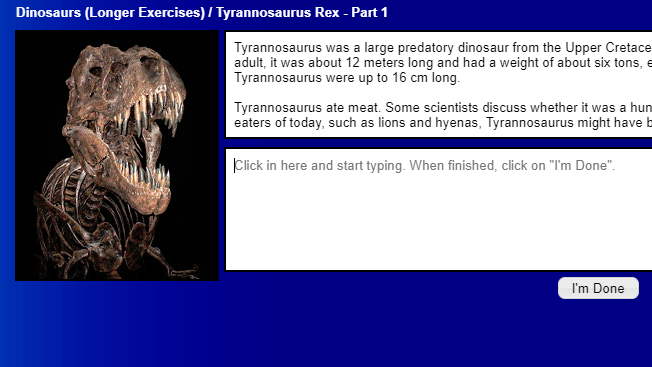 Use the built-in curriculum, create your own (including custom exercises), or allow users to freely explore. Learning and fun combined. 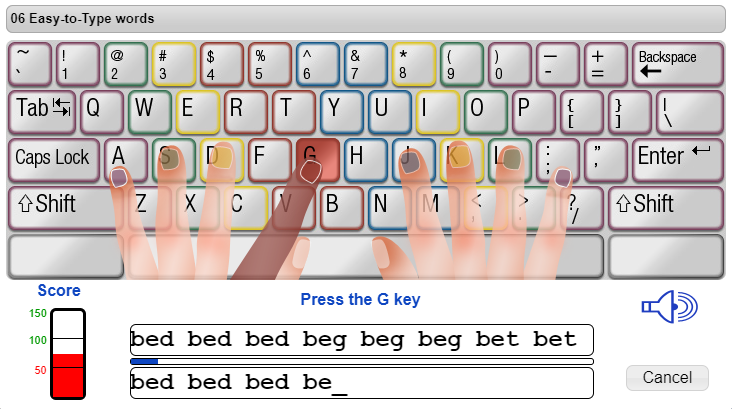 Typing games and over 2500 unique exercises are available. Track progress with detailed reports and graphs. Desktop and mobile device support: Windows, Mac, iPads, and Android tablets (with an external keyboard). Supports beginners as well as those who already have some skill and want to improve. Use the built-in curriculum via the site's computer-guided mode. Explicitly assign activities to your users. Allow users to free explore the site in self-guided mode. Create your own exercises to match the specific needs of your organization. For example, a medical office could create sample medical reports to be typed. Numerous options are available to customize the course to match each person's goals, skill level, and specific needs. Create and manage accounts for your users. Each user has a unique user ID and password. Upload account information from a spreadsheet or a database. You can upload new accounts, as well as upload a list of changes to existing accounts. Organize your users into groups, or even into additional administrator accounts. Assign exercises to your users. Monitor the speed of anyone who has used the web site. Get a quick summary or view all exercises taken, with errors highlighted. See how much time your users have spent on the web site, and monitor activities completed. See how close your users are to reaching their goals, and identify areas of strength and weakness. Filter your results by date range, exercise groups, and level of detail.